1. In a skillet, melt a small knob of butter over medium heat and toast corn until fragrant, about 3 to 5 minutes, stirring regularly. 2. Prepare the dressing by combining all ingredients (olive oil, greek yogurt, honey, apple cider vinegar, and mustard) in a small jar. Close the jar and shake vigorously to emulsify. 3. In a large salad bowl or shallow plate, add all the ingredients for the salad (romaine, spinach, corn, red onion, raisin, and feta). 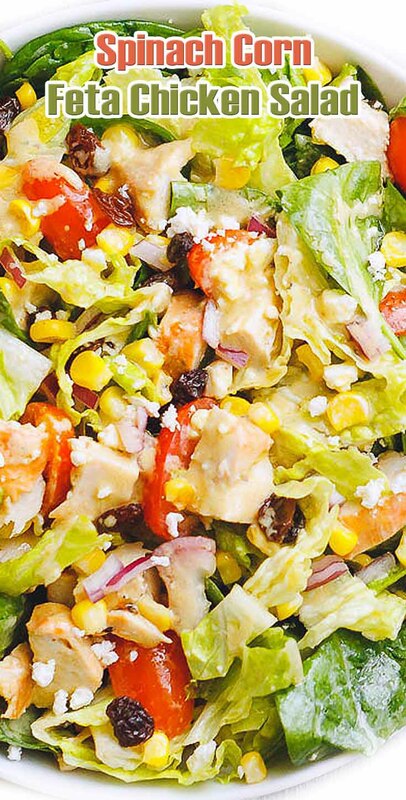 Drizzle the dressing on top and toss the salad to coat well. Enjoy immediately!